Terasic - 新聞訊息 - 2018 InnovateFPGA Grand Final is coming up! Join us at Intel Campus, San Jose! 新聞訊息 2018 InnovateFPGA Grand Final is coming up! Join us at Intel Campus, San Jose! The InnovateFPGA Design Contest is a multi-discipline engineering design contest hosted across the world and open to all engineering students, engineers, and makers. The contest was expanded from the previous 14th InnovateAsia Contests (organized by the former Altera and Terasic). 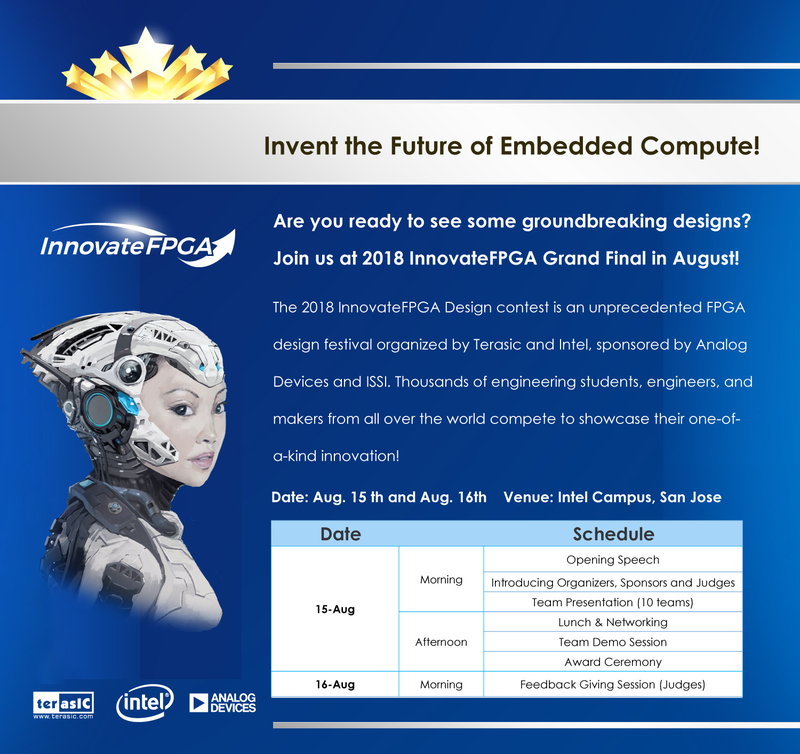 In the first InnovateFPGA contest, there are nearly 500 teams from hundreds of different countries and institutions all over the world, including renowned universities and companies such as University of California, Berkeley, McGill University, and NVIDIA － all competing for top prize and opportunity to have their designs promoted globally by Intel, Terasic, Analog Devices etc. Contestants toil through months of hard work, spending countless nights in their laboratory to bring forth their extraordinary innovations to expert judges and scientists through multiple stages of qualification. Having already experienced immense success in the past 14th InnovateAsia Contest, InnovateFPGA is appraised by students as one of the most critical stepping stones in their advancement towards learning digital logic design, discipline, and overall understanding of the industry. We cordially invite you to be our guests at the 1st InnovateFPGA Grand Final to witness the one-of-a-kind innovation invented by talented students and engineers from different part of the world!